Cass undergraduate and Team England athlete Cheriece Hylton talks studies, training and maintaining a social life. Running on a tight schedule is something that Cheriece Hylton, (BSc Business Management), is no stranger to. The second year Cass student processes business statistics and risk management on a daily basis, while also attempting to maintain a social life and train six days a week at gyms across the capital. 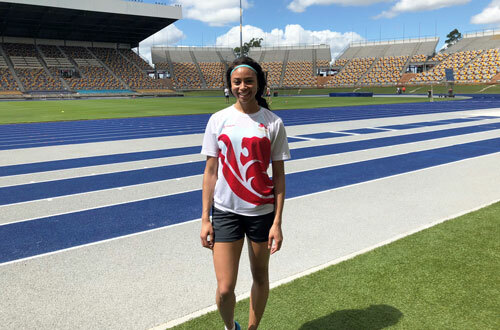 The Team England 400 metre relay sprinter admits that it is not always easy balancing her responsibilities, but upholds her love of education and athletics as two of the most important things in her life and is determined to take home gold at the Commonwealth Games. How do you balance your studies with your athletics training? “It can be very challenging, as the work at Cass is very intense. For example on Monday, I have business stats from about 10am-12pm, then afterwards I go to the gym and then it is back to City for my operations management lecture from 4-6pm. Tuesdays and Saturdays are my longest track training days, so there is little time to physically recover before I have to start thinking about my academic work. 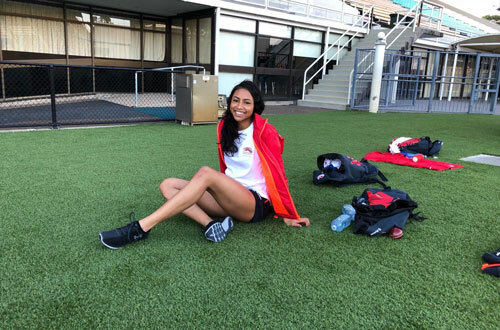 “Last year I actually took a gap year from university to focus on athletics for a year. I changed my coaching set-up, so I wanted to give myself time to acclimatise to the new environment without the pressures of university work. I always knew I would come back to education, but I wanted to make sure I was aware of what I was getting into. “I chose to live in student accommodation, but I do not have the typical student life. My friends invite me out, but I usually have training in the morning and cannot go. I would not change any of this for the world. I am able to balance things by being quite strict with myself and staying focused on what I want to achieve, which is racing and my degree. How does it feel to be representing your country at the Commonwealth Games? "To be able to wear the England vest at my first senior competition in such a well-established competition is unbelievable. I don’t think it will fully sink in until I get to the airport, but honestly, I cannot wait to get out there. I’m not putting any pressure on myself. Training has been going well so I want to go out there, and do myself and my country proud. If I can leave the Games doing that, then I will be delighted." How do you prepare for a race and are there any similarities when preparing for an exam? “I think the main one is that I visualise what I want to do. On Sunday, I was in Vienna running 400 metres, I knew the girls I was running against and I knew what I wanted to do, so I visualised it all in my head and executed that plan. I visualise things like driving my arms back as soon as I hear the gun to get out fast and then keeping my form in the last 100 metres. For exams, I imagine the questions I am being asked and visualise what I would write. What is the best thing about studying at Cass? How important is education in your life? “Very important, my parents always said education first and sport second. That means a lot to me as sport can be so short-lived, most athletes usually perform in a ten-year window before retirement. I have always wanted to go to university because I love learning and eventually I also want to do a Masters. Do you think young athletes need to take time out for themselves? “It can be a difficult as if you are really dedicated then nothing will stop you from doing what it takes to achieve your goal. I do sometimes have to sacrifice my social life, and that can be hard. Although while that may be a short-term sacrifice, I also know that it will benefit me in the long term. “That being said, you do need to relax, and this is similar to university, where it is easy to think you need to be revising all the time. You do need to have some time for yourself and be with your friends and family. Your body will follow your mind so if you are stressed, it will show in your performances. Sometimes you need to take a break from studying. I like to go to the spa when I can and taking time out like this is great for my mind and focus. What advice would you give to any sportsperson starting out at university? How does it feel having your twin sister running with you? “It is incredible to have her there, as she has been with me every step of the way, not only in athletics, but also in life. Whatever the outcome I know we support each other, even when we are racing against each other. She is my training partner and my competitor, but she is also my rock. Has your athletics helped you with your academic studies in Cass? “I think the qualities that I have gained with my studies and training has instilled discipline in me. I am very strict with my time management and realise that I cannot afford to fall behind in both my training and revision. I know that if I go to my lectures I have to write up my notes, the same way that if I am preparing for a race I need to be out training on the track. 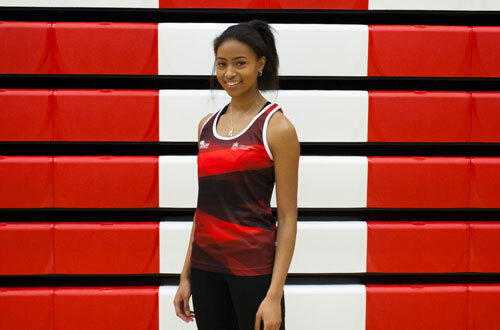 “Training for the Commonwealth Games and studying at Cass has really enhanced my vision. I have never competed at a major Championships during university term time before, so it has pressed me to be even more attentive to my time management.